Manifest Destiny - The Story of The U.S. Told in 141 Maps is a great website developed by Michael Porath. 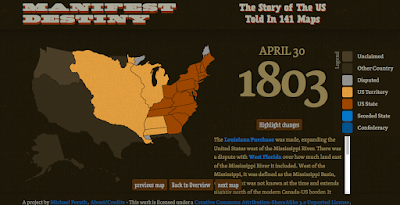 As you probably guessed from the title of this blog post, the site features 141 interactive maps chronicling the expansion of the United States from March 1789 to August 1959. When you click on any of the maps you will see the new territories acquired in that year and month. Each map is accompanied by a brief description of how the new territories were acquired. If you're creating a website or an interactive ebook to supplement or replace the textbooks in your U.S. History curriculum, Manifest Destiny - The Story of The U.S. Told in 141 Maps is a resource that I highly recommend including.